Pattern of sand and debris on pavement indicates GRAD came from east. Seven civilians were killed and 17 wounded in a GRAD shelling of the Mariupol suburb of Sartana on October 14, 2014. Evidently the victims were taking part in a funeral procession. Sartana is a town of 11,000 inhabitants of whom about 70% are Azov Greeks. The town is on the west bank of the Kalmius River, in territory previously marked as Kiev controlled. According to the estimates so far, the mortars have come from Russian-speaking separatists in the region of Donbass, who may be trying to hit a Ukrainian army outpost located in the area. "I appreciate that this is not necessarily to start an escalation of violence, but a reminder from separatists that are in the area and maintain their positions. However one can not know what will happen next, and separatists groups seem to act uncontrollably and not under the control of so-called government of the breakaway region, "says a diplomat serving in Ukraine. The accompanying video shows an Azov Battalion member inspecting a GRAD rocket engine on a field somewhere in the area. The Mariupol city council declares a day of mourning on October 15. A public requiem is held under nationalist colors. Mariupol news published a set of photographs. Military Maps marks the area as contested or likely under NAF control. Talakovka on the east bank was recently taken by the militia. a fight happened on the road from Kominternovo on October 13th. GRAD fire was seen hitting the area. Lomakino also on the east bank was marked as NAF held on October 14th and Kalinovka to the southeast. Sartana is marked 2014-10-14 22:33:46 with this text: САРТАНА – От местных - тяжёлый обстрелы со стороны укроармии. Пытаются выбить ополчение и запугать население. From local - heavy attacks by ukroarmii. Try to knock out the militia and to intimidate the population. On October 15th Sartana, Lomakino, and Talakovka are marked as under the control of the Ukrainian Armed Forces. This video from Ukraine Channel 7 supposedly confirms the fact. The video is from Spartak near the Donetsk airport, but someone calls in from Talakovka. The spot is at the northern end of General Kurkchi Street, just 100 meters south from what Military Maps marks as the defensive line around an industrial complex marked as UAF staff. The victims are on the eastern side of the pavement, opposite the utility post on the western side. The evening sun is shining from the west. The Channel 5 video shows OSCE observers arriving from the south. The pipe of the rocket points to the east, but may have forded over. The scars on the pavement point to an west-to-east impact. More distant NAF positions are all between northeast and southeast. Outgoing (possibly incoming) GRAD fire is seen in the distance in the north-northwest. One eyewitness indicates that something came from the north-northwest. None of the videos or photos indicate a clear military presence. A longer version of the video shows two man in camo trouser picking up the bodies. these could be militia members. OSCE report confirms that people were killed, does not discuss where Grad was coming from. At 14:23hrs, the SMM – in Mariupol (113km south of Donetsk city) – heard what it assessed to be heavy GRAD shelling to the north-east of the city. The SMM subsequently visited Sartana (19km north-east of Mariupol), where it noted the remnants of a GRAD rocket. A man – who appeared to be a plain-clothes policeman – told the SMM that seven people had been killed and fifteen wounded in the village as a result of incoming shelling at approximately 14:20hrs. Later at a hospital in Mariupol, a doctor told the SMM that 14 people with shrapnel wounds had been admitted. 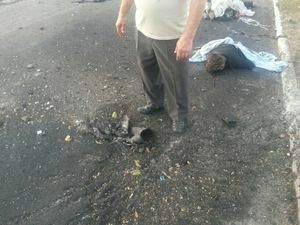 A priest, who said he had been at the scene immediately after the attack, told the SMM that he had seen several corpses. The SMM arrived in Sartana at 17:00hrs, and observed the remnants of a GRAD rocket lodged in the ground. Its positioning suggested it had been fired from the east. A man – who appeared to be a plain-clothes policeman – told the SMM that seven people had been killed and fifteen wounded in the village as a result of incoming shelling at approximately 14:20hrs. The SMM left the village after 15 minutes because of constant shelling exchanges, assessed by the SMM to have been taking place between Ukrainian soldiers at a checkpoint just to the east of the village and unknown, presumably irregular armed forces affiliated to the “Donetsk People’s Republic”, positioned somewhere further to the east. This also happened just before Putin is to visit Serbia and than possibly meet Poroshenko at a Europe-Asia meeting. This page was last edited on 16 October 2014, at 06:08.